As political and consumer preferences push carmakers toward a new future, executives from supercar brands admit they are open to assisted-driving technologies—and even to quiet electric engines. Attitudes are shifting rapidly across the sector. 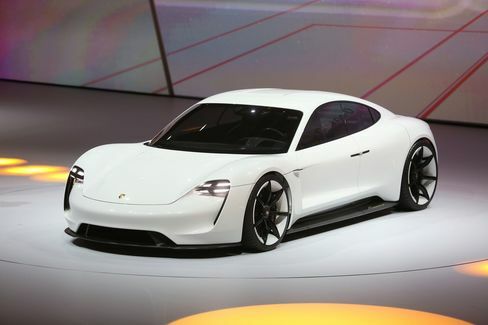 All-electric models are starting to creep into the sports car segment, epitomized by the splash Porsche made in September with its Mission E concept. Mercedes-Benz and BMW are vying to make the best highway steering assist, an important step toward autonomous cars. And even the likes of McLaren, Porsche,and Koenigsegg, maker of the $2 million plug-in hybrid Regera, are open to autonomous features that would have seemed unthinkable just a few years ago for brands built on the thrill of the road. McLaren says it’ll have hybrid technology in half its models by 2022, as it invests 1 billion pounds in 15 new models and derivatives to boost profit. Work is starting on an electric-car concept that could ultimately be a follow-on for the P1 hybrid that went on sale in 2013. McLaren will also use automated driving technologies, especially functions designed to intervene and avoid a crash, though the driver must be able to take back control, Flewitt said. The Porsche Mission E Concept at the Frankfurt Motor Show in 2015. Supercar manufacturers hope the new technology will make their products more interesting, instead of repelling drivers who don’t want to become superfluous. Self-piloting systems that can help enhance the race-track experience and take the strain out of dull stretches of highway are attractive for any buyer, said Koenigsegg, who said he’s getting more inquiries from customers about such features. All his vehicles already connect to the Koenigsegg cloud and have Apple CarPlay. The broader car market is heading in the same direction. Last year, 37 percent of respondents in a McKinsey & Co. study said they’d switch manufacturers if offered full in-vehicle access to data and media, up from 20 percent the year before. The first step in the transformation, however, will probably be electric and hybrid supercars such as the P1, Regera, or Porsche’s 918 Spyder. Battery-powered engines provide an enormous boost to conventional combustion motors and will be necessary in order to flaunt a fast car in city centers that increasingly shut out polluting vehicles. The challenge they pose is their lack of an engine rumble: The sound of a V12 Ferrari Berlinetta screaming past is an intrinsic part of what car lovers associate with the brand. It remains to be seen whether a computer-generated roar will have the same resonance. 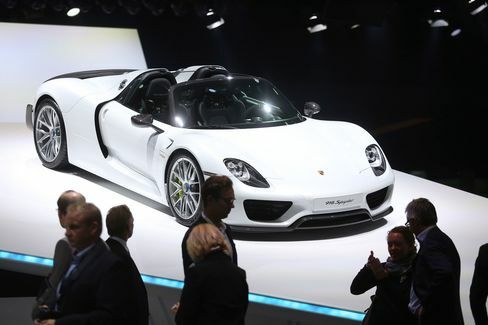 The Porsche 918 Spyder e-hybrid.